Dejection after losing to Italy for the first time in the Six Nations. IRELAND WOMEN ARE down to 10th in the World Rugby rankings after their worst Six Nations finish in 13 years. Adam Griggs’ side endured a miserable campaign, finishing fifth in the 2019 tournament with just one win and four defeats from their five outings. It ended with a 24-5 defeat to Wales in Cardiff on St Patrick’s Day, while England won the Grand Slam. 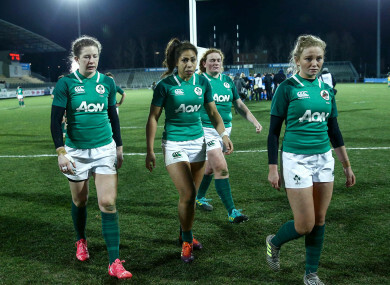 The Red Roses ran riot at Donnybrook on the opening night, while Ireland’s sole win of the campaign came against Scotland at Scotstoun. A first-ever Six Nations loss to Italy and a heavy defeat to France completed a disappointing run of clashes. Ireland now fall below Spain to 10th in the rankings, as the nations trade places. 2017 World Cup champions New Zealand remain top of the charts with England in second. Canada move above France as they trade places in third and fourth, while Italy move up to sixth. You can see the rankings in full — and from 10 onward — here. Email “Griggs' Ireland fall to 10th in latest World Rugby rankings after dismal Six Nations”. Feedback on “Griggs' Ireland fall to 10th in latest World Rugby rankings after dismal Six Nations”.